Three years ago, Shullsburg native David Landau took a flying leap out of his comfort zone and landed smack dab on the stage, a place where he's managed to find great enjoyment in his life's journey. This weekend, Saturday, April 23, Landau and anyone who'd like to join in the fun, will celebrate the release of his second CD, "Kids and Kitties." The release party will take place beginning at l p.m. at the Brewster Cafe, Shullsburg. Admission to the event is free. A first grade teacher for 11 years in the Verona School District, Landau had many opportunities to see live performers visit the school to entertain and teach the eager young students. He thought the performer's job looked fun and decided he'd draw from his bluegrass band experience - what he'd always considered his release from the classroom - to launch his own traveling performance troupe. Armed with his guitar, a love of children and music, he would be the soul performer. After Landau, a 1985 graduate of Shullsburg High School and the son of Dr. Louis and Ellie Landau, got the idea in his head he was unstoppable. To train, landau started attending open mic nights at Madison venues to become more comfortable as a performer. When he asked his principal if he could perform for other elementary classes, he was first turned down and then was allowed to - if he made sure his teacher duties were finished when they needed to be finished. The next year, hooked on the idea of full-time performing. Landau took a leave of absence from his job. "And then I never went back," he said. Although it's a music job, Landau noted the hours are during the daytime, which makes it nice. He's able to get up in the morning, drive to his performance and be home in the evening. "It's kind of the best of both worlds that way," Landau noted. Starting out with primarily elementary-age students, Landau now includes preschoolers and even, on occasion, middle school students, who he says seem to enjoy the songs just as much as the smaller kids. Besides taking his love of music to children, Landau also does inservices for teachers on how to integrate laughter and music into the classroom. One of the perks of his job, Landau said, is everyday is different. Even though Landau has been gone from Shullsburg officially since he enrolled at UW-Madison to pursue his degree in education, performances often bring him either home or pretty close to home. And when Landau makes appearances in this area, he said all he has to do is mention his hometown. "I tell them I'm from Shullsburg, and I'm their buddy," he laughed, noting he's performed in Shullsburg, Darlington, Cuba City, Potosi, Benton and other communities in southwest Wisconsin as well as other areas of the state and into Iowa and Illinois. The 38-year-old said he's always listened to music and even played the trumpet in the band in high school, but it actually wasn't until he left for college that he really got hooked. About two decades ago now, Landau learned the guitar. 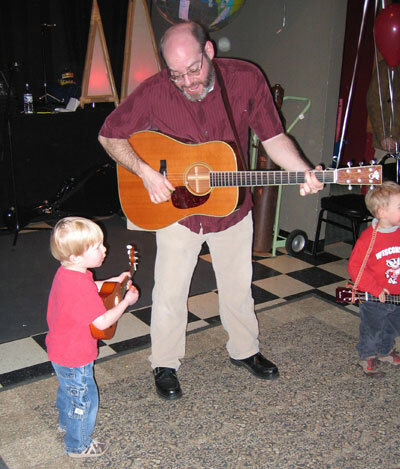 When he started teaching, he took the guitar into the classroom, quickly learning that children love songs that feature both monkeys and trains. For several years now Landau has been a member of the Cork 'n Bottle String Band, a group which performs along with Landau on both his CDs. After launching his performance career, Landau learned that not only do children like monkeys and trains, but the also enjoy hearing children in the songs. He brought a group of students into the recording studio to sing with him for both CD endeavors, "Music for Kids," in 2002, and the latest "Kids and Kitties." Landau won a Parent Choice award in 2003 for his first CD. In addition to enjoying the schools he visits and the interaction he continues to have with students at all performances, Landau feels rewarded. "I still get to do all the fun things I did in teaching," he noted. In his free time, Landau spends considerable time sending off marketing tools to various venues to advertise his work. He said as long as the bills are paid, he's happy doing what he's doing. "Working for yourself is a cool thing." For more information about "Music for Kids" or "Kids and Kitties," visit www.happytrails.biz. Website design and development by Thunder Ridge, Inc.